WE WILL BE CLOSED ON EASTER SUNDAY, MARCH 21ST, SORRY FOR THE INCONVENIENCE!! Located in the Village of Nottawa, just 5 minutes South of Collingwood. 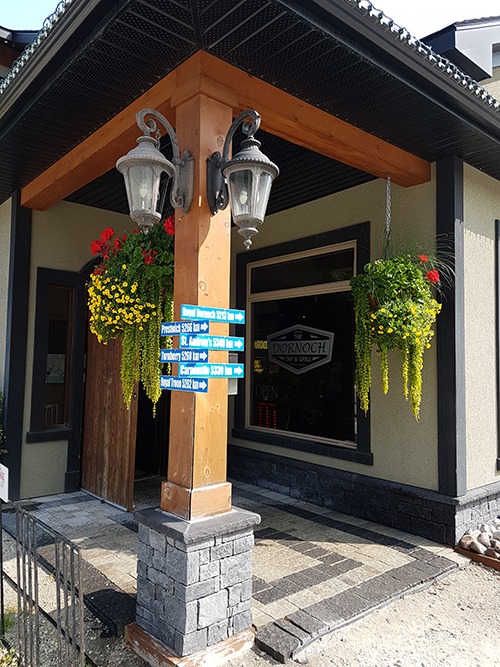 We have some great LOCAL BEERS on tap: Side Launch Dark Lager, Collingwood IPA, Creemore Premium Lager, Lot 9 Pilsner and Lake of Bays Sparkhouse Red Ale as well as Canadian, Coors Banquet, Bud Light and Triple Bogey also on tap. Catch all your favourite sporting events, LIVE on our large HD screens. NFL, NHL, MLB, PGA TOUR, College Football and Basketball, World Cup Soccer, Tennis, NASCAR, F-1 and much more. If we don't have on what you would prefer to watch, please ask one of our staff and they will do their best to accommodate your request. We have parking available for snowmobilers and are only minutes west from the OFSC trail in Batteaux. We have a bike rack available for cyclists and make a GREAT meeting place for hikers in the summer. On a bus tour, feel free to call ahead as we do have parking available for coaches. Our staff are extremely friendly and will provide you with great service, if you don't have what you need we'll do our best to make it happen!! PLEASE PROVIDE US YOUR FEEDBACK BACK FILLING OUT OUR GUEST EXPERIENCE FORM LOCATED AT THE BOTTOM OF OUR WEBSITE. BURGER NIGHT - Try our NEW Chipotle Bison or Duck Burger!! JOIN US, NEW PLAYER'S ARE ALWAYS WELCOME!! mushrooms marinated in a garlic butter, melted mozzarella/cheddar cheese blend and topped a panko crust. Grilled Panini on the side for dipping. iceburg lettuce toseed in a Southwest dressing and served in an edible flour tortilla bowl. Topped with cherry tomatoes, cucumber, red onions and a cheddar/mozzarella cheese blend, salsa and sour cream on the side. house breaded crisp panko crusted, mozzarella cheese, garlic oil/tomato basil sauce served with your choice of sautéed pasta or vegetable and potato of the day. By filling out this comment card you will be entered into a monthly draw for TWO, $50.00 gift certificates at The Dornoch Tap & Grill. 2017-18 was a Great Season! Come back out and play darts on Wednesday nights starting on September 12th from 6pm-9pm. Upstairs in the 19th Hole Lounge. Beginners and experienced players welcome. We will be playing a variety of games with teams this year as well as hosting a few tournaments. Loaner darts are always available, we have four dart boards, great food and cold beers. Monthly prizes. Join in anytime. Fun, Friendly and Free. Win prizes. PLUS if someone hits 180 score in three darts, they win $180 cash. Call 705-994-5051 or email Steve at: sdhgolfer@rogers.com or complete the form below to join. Please complete the form below if you would like to play darts! Thank you! We will contact you shortly. Steve. Copyright © 2014 The Dornoch Tap & Grill. All rights reserved.